Hopefully this is the part where they're fighting just before they realize they have a common enemy and team up to apply the beatdown. 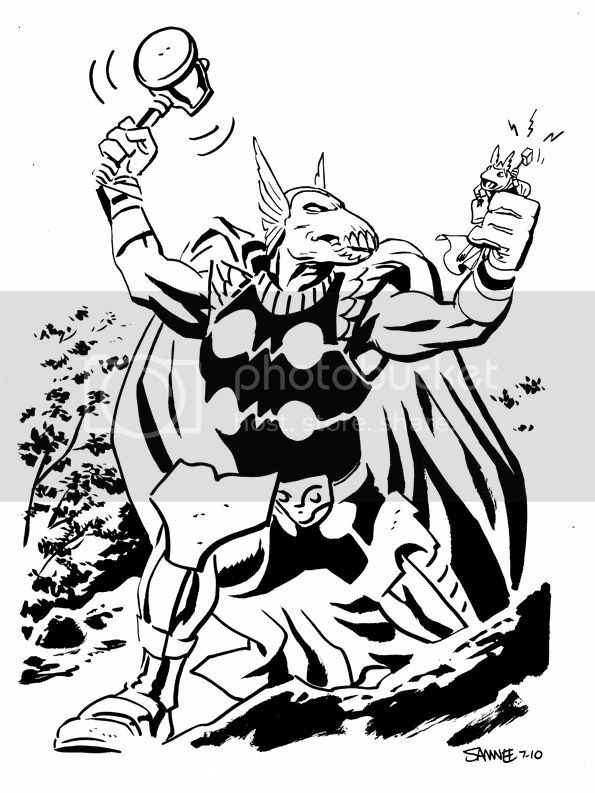 There is no way Beta Ray Bill could take the Thunder Frog like that. No way! I hate to ask, but can I get a sketch of the Thor family if I win? I LOVE your Thor family stuff. Excellent arwork, as usuel (sic!)!!! Love how you handle the b&W ! Fantastic sketch! Gonna try to get out of work to go pick up your new book.Need to think of a good excuse, not sure my boss will go for "it's THORsday!". If i can't get you a photo,will you accept a poorly drawn self portrait of me holding your new book? Just kidding! Good luck to all who enter,and Chris your too good to us(your fans)! Brilliant! This is such a fun sketch, Chris! Nice job appeasing your fans. Wonderful scaling on this one, Chris. Frog Thor looks appropriately (and comedically) diminutive next to Bill. Like Momar stated, your affection for the entire family of Thor characters is evident, and I'm really looking forward to seeing what magic you've been able to capture on the pages of your new Thor series.